We’d love your help. Let us know what’s wrong with this preview of Save the World and Still Be Home for Dinner by Will Marré. To ask other readers questions about Save the World and Still Be Home for Dinner, please sign up. 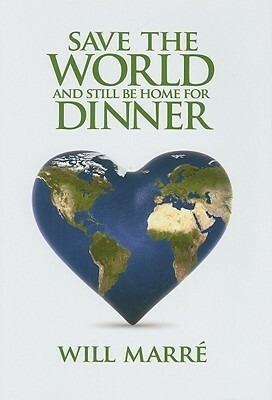 Save the World and Be home for Dinner is a wonderful book that emphasis the importance of taking immediate sustainable action in today's society while still being able to enjoy the simple things in life such as being home for dinner. In the past many business have followed the gain -> growth -> good model. This is seen in too many examples to count. There are plenty of successful people such as Andrew Carnegie who became rich by exploiting the labor of other people for their own personal g Save the World and Be home for Dinner is a wonderful book that emphasis the importance of taking immediate sustainable action in today's society while still being able to enjoy the simple things in life such as being home for dinner. In the past many business have followed the gain -> growth -> good model. This is seen in too many examples to count. There are plenty of successful people such as Andrew Carnegie who became rich by exploiting the labor of other people for their own personal gain but later got involved with philanthropy. This is not a very sustainable model nor does it maximize the total benefit for everyone involved. The original economic model articulated by Adam Smith saying that Capitalism provides the best outcome for everyone involved when the members of a society are acting in the best interest of themselves. This was later disproved by John Nash who believed that society reaches the best benefit when each individual in the group is acting in BOTH the best interest of himself and the best interest of the group as a whole. In today's day and age it is vital that we adapt the good -> growth -> gain model in business. This method will not only create a bigger pie for everyone take take part in, but it will help with the sustainability of the world to ensure the security of future generations. Another vital point that is mentioned several times throughout the book is the importance of eliminating the "I can have/be this OR this" thinking. As just one example, many people get lost in believing that in order to be successful in their career they must sacrifice bonding with their family. Will Marre claims that a better philosophy is "I can have both this AND this, because a balance is vital in my life." It is crucial that we each find out how we can personally let our talents and traits combine to fulfill our purpose in whatever it is that we do. Some interesting theories about finding your place in life (the Big Promise). It was short on practicalities however which isn't a surprise as the decision to go for what your inner soul tells you will make you most happy is a very difficult judgment. Book was recommended to me as I have been contemplating if there is something else I want to do. Getting a little late but better late than never some say.